I had a bit of a look through some of the Metawear SDK and I narrowed it down to public Task<Void> remoteDisconnectAsync() in BtleService, disconnectTaskSrc never completes. I've temporarily made this a TimedTask so that it will at least time out. See if this commit passes your tests. Thank you, I had a quick test and it worked. I'm now doing a live test and I'll let you know if I find any issues. I'm using binary version of the API. When the fix will be available? Hello, like @Luca we are using the binary version of the library and it would be important to have this fixed asap. Have you tested the previously linked commit with your apps? i would like to know if the fixes work for you before releasing it. I've tested my application using the linked commit and the problem is still there. 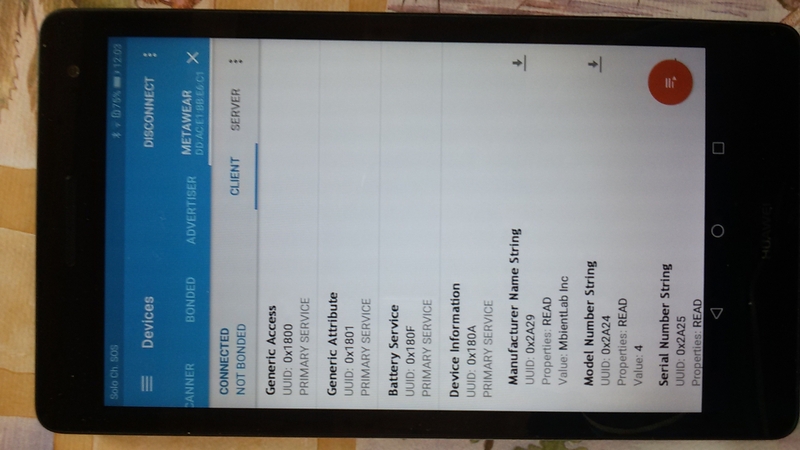 Samsung Galaxy Tab S2 running Android Nougat (7.0). Post the code you are testing with and provide instructions on how to get the API to hang on connectAsync. // copiato da app "starter"
* Called when the user has selected a Bluetooth device from the device list. * Handle the reconnection after a dropped BT connection. Based on the above code, it seems like the reconnect attempts continuously fail, not that connectAsync never terminates. Regarding the Huawei device, try to connect to devices with another BLE app, like the nRF Connect app, and also post the errors returned from the (re)connect attempts. The above code, as you surely see, is the one you showcase in the tutorial/starter sample. If that is not the best connection code skeleton, please update it to a better one. Why you don't modify your MetaBase app, so that it collects and sends error/debugging information, that can be used by you to debug your API? I simply pointed out the the likely root cause of this infinite wait you are seeing on the Huawei device, not that there is anything wrong with the code. Furthermore, the tutorials are to help you get started; it is up to you if you want to continue using the code or modify it to fit your app flow. The starter app code includes a cancel button so you can cancel the connect attempt if it is taking too long. I am not talking about your Huawei device failing to connect in MetaBase. You stated the device cannot connect with your app; the next logical step is to see if that device can even establish a connection with a generic BLE app. A quick search on Google shows that people have issues with Huawai devices on other platforms, such as the FitBit devices, so this seems like an issue that Huawei needs to address. MetaBase already collects error information however, as previously state, this seems like an issue with the Huawei device. b) we tested the software on other Huawei devices and had no issues. I made an attempt with nRF connect. If I select Yes, the connection fails . If I select Cancel, then try again, the connection succeeds. Almost the same happens to me too. Unfortunately the code is too complex to be posted piece by piece giving it a sense. And I can not send the whole project. What I observed while developing is that, if the application crashes while connected to MetaWear boards streaming gyro and accelerometer data, when I restart the application often, not always, the connection procedure blocks without giving any timeout. 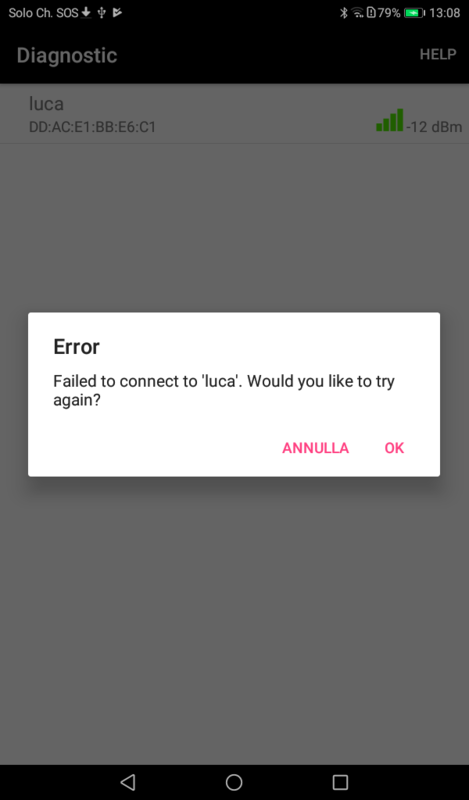 As like as @Luca, If I restart again the application, everything comes back to work. And to confirm, the TimeoutException you posted above is still occurring with the API variant posted in this thread? The read characteristic error is a good starting point; I will try to reproduce it on my side. Hrm, this issue with connectAsync never completing after a crash is very odd. Are you sure connectAsync is in fact hanging and the code is not attempting to unsuccessfully reconnect? Yes, with the latest code I posted in the .zip attachment. and it never reached the breakpoint. I have not been able to reproduce either issue with our Android devices. For the stack trace issue regarding the onCharacteristicRead callback function, I forced the API into throwing that exception by never reading any characteristics. connectAsync failed, as expected, and continuously failed with every reconnect attempt. When testing the connect - streaming issue, the only issue I ever encountered was a non-zero connect status, which immediately competed the connectAsync task. I was streaming both gyro and acc at 100Hz for this test.